This entry was posted in alignment, authenticity on 15 September 2015 by Martina. I’m just about to embark on my first-ever book tour for What if..? How to Create the Life You Want Using the Power of Possibility. As I’ve been preparing for the tour and the various events and meetings with the media, I’ve been focusing on the main theme of the book, which is actually the main theme of my work: authentic alignment. What does it really mean to be in authentic alignment with you who are? What is authenticity? Authenticity has nothing to do with anything external to who you are inside (your deep inner knowing) even if it disagrees with those around you. However, and this is key, your authentic self is not superior or more “right” to anyone around you either. Your authenticity has nothing to do with your neighbor’s authenticity. Authenticity is a solo-endeavor, ventured upon with respect, humility, passion, and grace. It does not ask what others think or feel, it does not compare or compete. Authenticity is about you being true to you, while also being respectful of that which is not you. So, then what is a life of aligned authenticity? Well, when we are out of alignment with who we are, that dissonance creates opportunities for all sorts of challenges to come cropping up, including obstacles, despair, discomfort, and anxiety, to name just a few. When we are in alignment with who we are, we feel a gravitational pull toward some kind of joy. Life seems to flow, almost effortlessly. We follow the breadcrumbs and build a meaningful presence, even if it only makes sense to ourselves, perhaps especially if it only makes sense to ourselves. Alignment is where your true power lies. It’s at the root of empowerment, manifesting, and creating. It’s at the core of your existence, and it’s what compels you to seek, explore, learn, grow, and pursue. It’s also what invites you to repeatedly show up, forgive, be humble, and love. When we are in touch with our true essence – that which we are at our core – everything becomes possible. We are tapped directly into the Power of Possibility and life becomes a creative, meaning-filled, and joyful dance. Aligning with that truth is an exercise in grace, commitment, compassion, and patience. And it’s worth every step along the way, because it ultimately leads us back to our true self, back to Love. This entry was posted in authenticity, beliefs, Jen Pastiloff, joy, Love, manifesting, sharing, workshop on 25 August 2015 by Martina. When people are doing what they’re meant to be doing, it’s evident. They have a certain glow about them. A radiance. They’re aligned with the infinite power of the Universe and it simply can’t help but pour out through every inch of them. It’s in how they walk and how they talk – how they’re most human – that they express this pathway to the Divine. Jen Pastiloff is doing what she is meant to be doing. 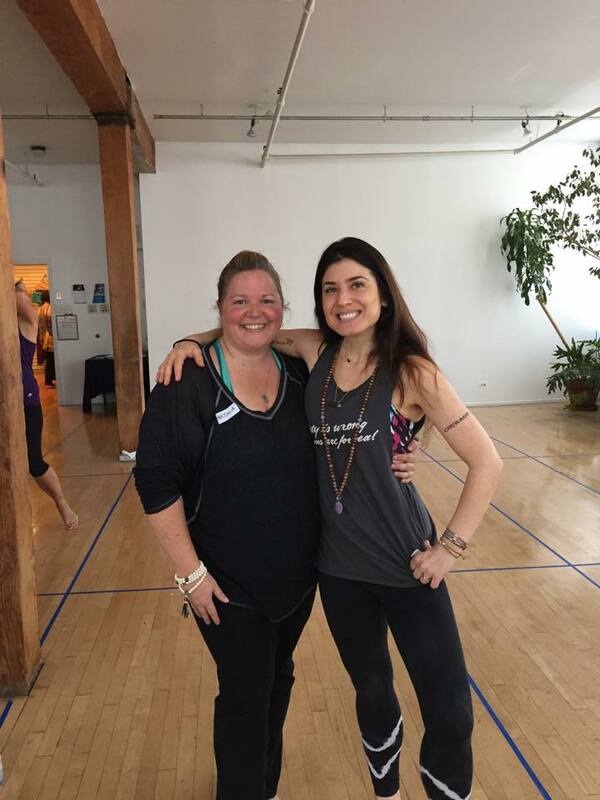 She’s one such example that I had the good fortune to spend three hours with this past weekend at her ‘Manifest-Station: On Being Human’ workshop at Moksha Yoga in Chicago. It was one of the best workshops I’ve ever been to. Hands down. How do you define what Jen does? How do you explain what she accomplishes in the time span of 3 hours, or about the length of your typical NFL football game? She herself has asked this question. In many ways her workshop defies explanation, though there are many adjectives to describe it: amazing, miraculous, transformative, beautiful, stunning, to name a few. It’s easy to gush about it, but hard to actually explain how it all happens. Jen reconnects you with your humanity. In fun, engaging, provocative, and thoughtful ways, Jen combines music, movement, and moments to open you up to that which you are and that which you’ve been hiding. Through a series of writing prompts Jen invites you to explore obstacles, beliefs, patterns, and love. Through basic yoga movements, Jen gets your body (and soul) up and engaged in the process. She has developed a workshop that takes you on a journey of the heart through the doorway of the body, using the physical senses of touch and sound. But what about the emotional? It was nothing that I expected, and everything I needed. Between the yoga poses we wrote, explored, and shared. Between writing we moved, laughed, and sang. We even had a hug fest and a dance party! We held each other up as we sat alongside one another, connecting at the most human of levels. It truly is a workshop that opens you up to see, feel, and understand yourself in new ways. And that’s what Jen does: she reconnects you to your verve, your humanity, to humanity, in general. She creates a space in which it’s not only safe to be human, but celebrated. It’s a gift. Jen is a gift. She is walking her path with grace, love, and joy. And the joy is contagious! When I find something that I feel is extraordinary, I have to share it. Jen is extraordinary, her workshop is extraordinary, and the fellow attendees are extraordinary, no doubt because of who Jen attracts and supports by simply showing up in life. To Jen, my immense thanks and deep gratitude for showing up, walking your path, and sharing that presence with those around you. You are the real deal. It was a gift and a pleasure to share that space and time with you. I look forward to our paths crossing again. To learn more about Jen, please visit her website at jenniferpastiloff.com and check her out on social media, where she posts regularly. This entry was posted in authenticity, awareness, change, mindfulness on 5 March 2014 by Martina. The best and most supportive advice I’ve ever received has also been the hardest for me to achieve. Why? Because it was so simple and paradoxically complex. Well, for me, it meant being open to the process. A process that is ongoing and has taken several years to get “jump-started.” Much like so many in show business that are classified as “overnight successes” – all the years of hard work and dedication that led up to that point don’t show once the spotlight (finally and luminously) hits them. So it is with authenticity, or being yourself. Change doesn’t happen overnight. (Unless it’s a gestalt shift, which is possible, but a blog for another day.) Rather, it’s a process of slow, deliberate, and conscious awareness-raising and decision-making. Being myself is all I’m ever capable of, and all I’ll ever need to be. And that’s more than enough, whatever “myself” is. And I think that, right there, is my spotlight of “overnight success.” It was like finding that last puzzle piece that had fallen under the table. You knew it was there, and the puzzle was basically finished, but the nagging feeling from that missing piece doesn’t leave until it’s put in place. Years of searching for the absent piece (processing, learning, remembering, unlearning, reading, listening, talking, sharing, growing, crying, changing, fearing, laughing, sorting, and every other “ing” you can think of) have resulted in my finally being able to receive the best advice I’ve ever been given…and embody it! Woo-hoo! So, my friends, it really is that simple, and it really was that deliciously complicated. And I wouldn’t have it any other way.